A few months ago we got our hands on the latest product to come out of the Sonos stable and we’ve been listening to it ever since. Their wireless subwoofer is a handsome beast and its relatively neat dimensions (402 x 158 x 380mm) belie its heft – a dense 16kgs. If quality equalled weight then we’d already be onto a winner here. Powering the Sonos SUB are two Class-D digital amplifiers and the enclosure uses dual acoustic ports to enhance its bass response even further. Build – The ‘hewn from a block of granite’ build quality and sleek lines of the Sub are the first things to hit you as you pull it from its packaging. Sonos have used a novel design here, choosing two 4.5 by 7 inch force-cancelling speakers positioned in a face off across a central void. They are rightly proud of the resulting vibration free design, there’s certainly no rattles or buzz from this cabinet. Sonos say you can use the sub standing up or lying down, even pushed underneath a sofa or bed. On the side you’ll find the same single ‘Connection’ button that’s on the bridge whilst living underneath is the power socket plus an Ethernet port should you prefer to hard wire the system instead of relying on it’s wireless technology.. 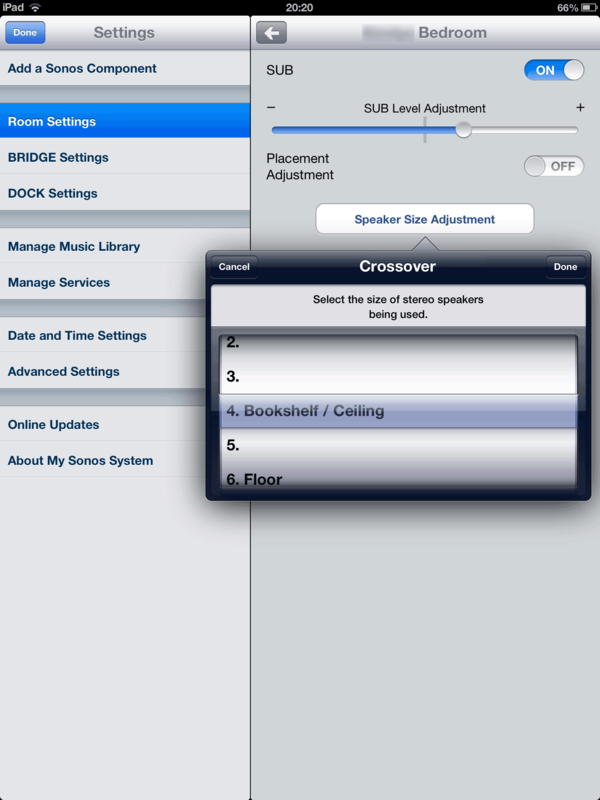 Setup – The Sub works with all Sonos amplified components. Currently that’s the CONNECT:AMP, ZonePlayer 120, ZonePlayer 100, PLAY:5 and PLAY:3 (it doesn’t work with the non-amplified Sonos CONNECT, ZP90 or ZP80). Adding the Sub to a room with one of the compatible zone players listed above is the usual guided experience from Sonos that you’ve come to know and love. After the system detects the new component you select which room / zone it’s in. Next you hear a couple of alternative tones to choose either A Louder, B Louder, or No Difference . Presumably this is something to do with phasing. Finally the system plays you tones and allows you to adjust the level of the sub in relation to your speakers. All this is completed in a couple of minutes. Control – As with the rest of the Sonos range you can control the SUB from your computer, smartphone or tablet. Download the free apps here for Android, iPad, iPhone, Mac or PC. Whilst the gain control on a traditional sub is usually a hard-to-access knob round the back, the Sonos allows you to tweak the levels from your remote. You may even be feeding the audio out of your telly or set-top box into the input of your Sonos zone to use it to beef up the sound. In any of these cases it would be nice to be able to adjust the subs gain a little easier than having to navigate so many levels deep to get at it. 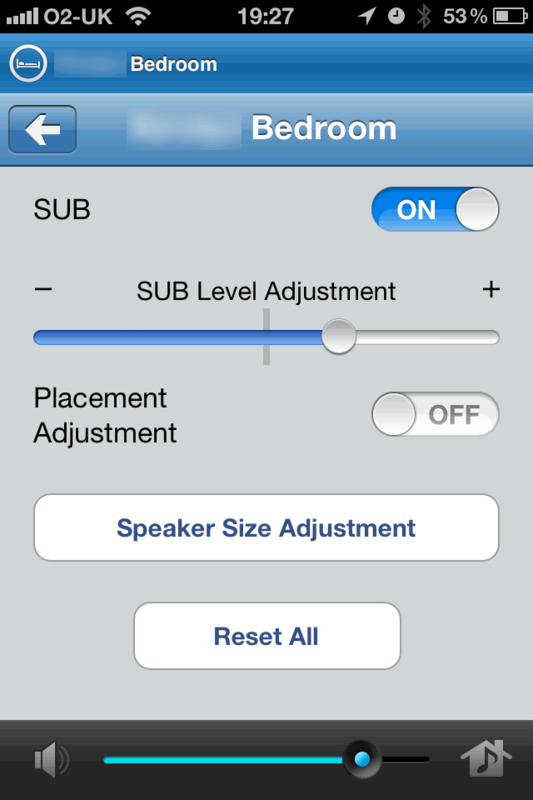 You can also change the Speaker Size Adjustment from the control screen. This effects the cut-off frequency and allows the unit to blend best with your existing speaker setup. Sound – First a confession. Being a child of the 80’s there’s nothing I like better than some nice ’round’ sounds, particularly electronic music, think Yazoo or Depeche Mode. We decided to test the Sonos Sub in one of the bedroom zones in our home that uses a ZP120 with a couple of Tannoy bookshelf speakers. They sound decent enough, but there’s not a huge amount of bass from them. Something we’ve always loved about the Play:5 is the warm sound that it produces, but this is something else entirely. The Sub extends the bass of your Sonos setup, but without ever getting to that flappy, uncontrolled place of less sorted subs. This ‘tight’ bass sound is pleasing to the ear and we found it ideal for music playback in this bedroom zone. There’s certainly plenty of headroom to fill a bigger space too and even when we cranked the system up to volume levels in the crazy region, where furniture starts to rattle and things on shelves start to move, there’s no hint of distortion. Conclusion – As with all Sonos equipment you pay a premium for all this elegance and simplicity. The high-gloss black lacquer finish model as tested here is £599 and the matt black version is £499. But it’s by no means form over function. If you already have a Sonos setup then you already appreciate the value of the system. If you’re in need of adding some low frequencies to your setup then the new Sub certainly won’t disappoint. 3 Comments on "Sonos Sub Review – A Wireless Woofer Wonder"
A combination of this and the sonos soundbar it’s going to set you back by quite a bit. Even though I do like their stuff and several people at work have it and rave about it, I think I would rather have an AMP (just like you do with your Mac Mini) and separates) far, far cheaper and better sound. However, saying that. Any pro or idiot (the latter being the reason why at my work use them) can set this up, configure and use, hence why it has such an appeal.